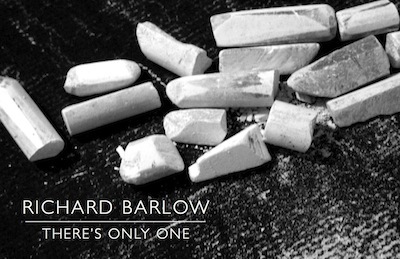 Richard Barlow, “There’s Only One,” 11′ x 50′, chalk on blackboard paint, 2012. Wedged between the student mailboxes and Einstein Bagels inside the student center at Augsburg College is a sliver of a gallery that Richard Barlow has transformed into a forest. Or, more accurately, he’s made a subtle, delicate, and stunning representation of a forest rendered in white chalk on blackboard-painted wall: There’s Only One. The shape of the gallery makes it difficult to see the temporary wall drawing as a whole; reflections on the glass walls that encase the space obscure the view from afar, but if you stand in the door jam, you can take in the fullness of what is a masterfully executed 500-square-foot-plus piece. Efficient chalk lines and smudges outline tree trunks that grow up out of a forest floor dappled with light. Up close the work looks abstract, but seeing the piece from a distance (such as the small space allows, anyway) places the viewer intimately inside an old growth forest. There’s Only One is part of a series, Welcome to the Open, for which Barlow appropriates the imagery of nature used in SUV ads for Hummer and Jeep. His co-co-opting of the very scenes used to sell us an experience of the natural world – access the sublime through better auto travel! — adds a provocative conceptual dimension to the work’s already impressive form. And that source material makes the fragility of Barlow’s work all the more poignant, for unlike the enduring environmental effects of driving a Hummer, Barlow’s photographic drawing is here today and gone tomorrow – quite literally. His intricate chalk drawing will simply be wiped away at the close of the exhibition this weekend. Barlow’s work here has the effect of a well-executed sleight of hand – immersed in his painstakingly rendered forest-of-chalk the viewer is genuinely transported, if only temporarily. If a walk at Afton State Park isn’t in your pre-holiday schedule, I highly recommend stopping by for a dose of forest therapy in the heated comfort of the Augsburg commons this week. Exhibition postcard courtesy of Augsburg College. Richard Barlow: There’s Only One — a site-specific, 50-foot chalk-drawing from his series Welcome to the Open — is on view at Christensen Center Art Gallery at Augsburg College in Minneapolis through December 19. Sarah Peters is a Twin Cities-based artist, writer and arts programmer who is interested in public engagement with the arts and critical issues of our time.